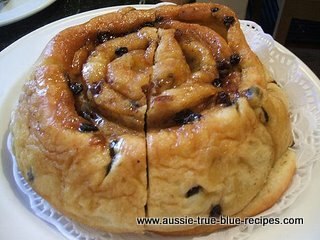 Roll out dough into an oblong and spread on it half the fat and half the sugar, covering only the top two-thirds of dough. If caraway seeds or currants are used, sprinkle over fat and sugar at this stage. Fold dough into three, bringing bottom third up first, and folding top third over it. Seal ends by pressing with rolling pin, and give one half-turn. Roll again into an oblong, spread top two-thirds with remaining fat and sugar, fold and turn as before, then roll out to fit a Yorkshire pudding tin, making dough 1-1 1/2 inches thick. Leave it to rise in a warm place and bake in a moderately hot oven for 3/4 - 1 hour. When half cooked, the cake may be brushed with thick sugar and water syrup.